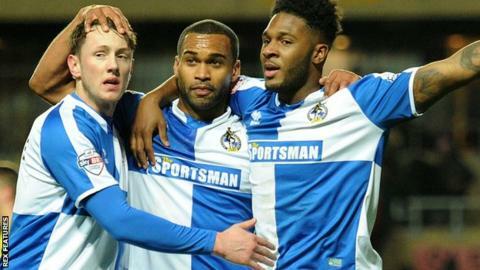 Bristol Rovers came from behind to win at fellow promotion-chasers Oxford through Ellis Harrison's late penalty. Kemar Roofe pounced from a corner to put Oxford ahead just after the break with his 18th goal of the season. But the lead was short-lived as Matty Taylor headed in an equaliser from Daniel Leadbitter's searching cross. As the game looked set for a draw, Jermaine Easter broke through the Oxford defence and Sam Slocombe brought him down to concede the penalty. Rovers climb a place in the League Two table to fourth and close the gap on third-placed Oxford to just two points. The Us lose ground on top two Plymouth and Northampton, who both won on Saturday. Following the game, it was announced Rovers' match-winner Harrison would be joining fellow League Two club Hartlepool on a month's loan. "I thought from a performance point of view, I couldn't really ask the players for any more. I thought we were fantastic to be fair. "We just got hit by a couple of sucker punches. "The penalty is one of those where when you come out like that as a goalkeeper, you almost invite the referee to put his whistle to his mouth. "I'm not convinced by it as there were two or three shouts we had turned down. But, we shouldn't have given them that opportunity to get one." "I'm absolutely delighted here. The way it is at the minute, I'm in the middle of discussing a new long-term contract with the club. "From that point of view, I couldn't be any happier." Match ends, Oxford United 1, Bristol Rovers 2. Second Half ends, Oxford United 1, Bristol Rovers 2. Attempt missed. Callum O'Dowda (Oxford United) left footed shot from the left side of the box misses to the right. Attempt missed. Kemar Roofe (Oxford United) right footed shot from the right side of the box is too high. Corner, Oxford United. Conceded by Tom Lockyer. Attempt blocked. George Baldock (Oxford United) right footed shot from a difficult angle on the right is blocked. Goal! Oxford United 1, Bristol Rovers 2. Ellis Harrison (Bristol Rovers) converts the penalty with a right footed shot to the centre of the goal. Sam Slocombe (Oxford United) is shown the yellow card for a bad foul. Penalty Bristol Rovers. Jermaine Easter draws a foul in the penalty area. Penalty conceded by Sam Slocombe (Oxford United) after a foul in the penalty area. Attempt saved. Callum O'Dowda (Oxford United) left footed shot from a difficult angle on the left is saved in the centre of the goal. Corner, Oxford United. Conceded by Steve Mildenhall. Attempt saved. John Lundstram (Oxford United) right footed shot from outside the box is saved in the top right corner. Substitution, Oxford United. Pat Hoban replaces Chris Maguire. Substitution, Oxford United. Danny Hylton replaces Alexander MacDonald. Joe Skarz (Oxford United) wins a free kick in the attacking half. Liam Sercombe (Oxford United) wins a free kick on the right wing. Attempt saved. Matty Taylor (Bristol Rovers) right footed shot from the centre of the box is saved in the top centre of the goal. Attempt missed. Stuart Sinclair (Bristol Rovers) right footed shot from outside the box is too high. Attempt missed. Rory Gaffney (Bristol Rovers) left footed shot from the left side of the box misses to the right. Corner, Oxford United. Conceded by Tom Parkes. Attempt blocked. Alexander MacDonald (Oxford United) right footed shot from outside the box is blocked. Attempt saved. Liam Sercombe (Oxford United) right footed shot from outside the box is saved in the top centre of the goal.